The Louis August Jonas Foundation’s mission is to develop in promising young people from around the world a lifelong commitment to compassionate and responsible leadership for the betterment of their communities and the world. We do this at Camp by fostering an appreciation of both diversity and our common humanity, expanding intellectual horizons and heightening artistic sensibilities. Our mission is woven into all activities which develop leadership abilities and self-reliance. Camp offers and demonstrates a philosophy of living to serve society through the pursuit of humanitarian goals. LAJF and Camp Rising Sun want to highlight how Camp impacts the lives of our alumni. We are excited to feature our alumna Jessica (‘15, ‘16) from Maryland. In her own words this is how Camp has impacted her life thus far. At the age of fifteen, I was given the opportunity to go to Camp Rising Sun, a full scholarship international leadership program. There, girls from over thirty countries, went from being complete strangers with countless differences such as, religion, race, and culture to being family. 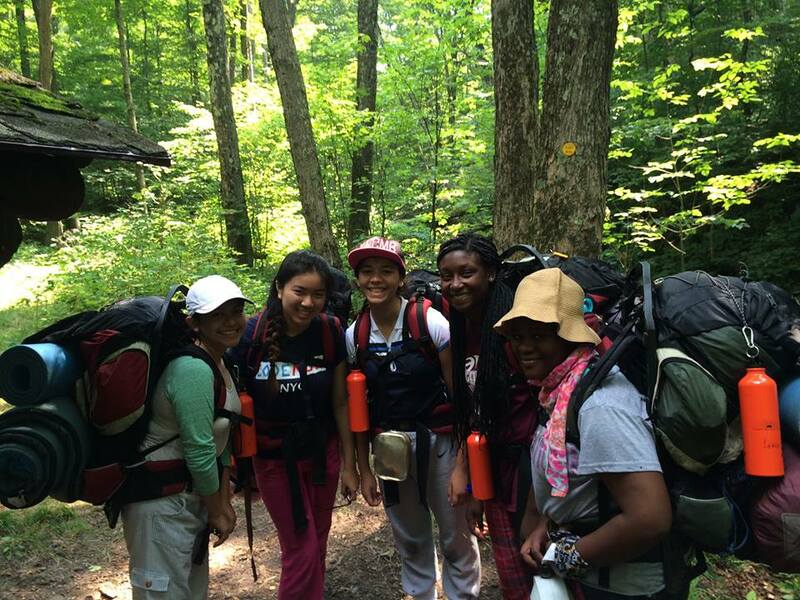 During my time at Camp Rising Sun, I met girls with diverse backgrounds. From one who had never left her small midwestern town, to another who drove by the Egyptian pyramids on her way to school. I learned about countless cultures and in return I explained my own culture. This experience showed me, that although we, as individuals, have many differences, we also have many similarities. And, that we should try our best to embrace both our similarities and differences. I believe that the borders that divide nations should not be the borders that divide people. Unfortunately, my belief about the world, is not one everyone has. With global leaders starting wars and people using violence to attempt to resolve their differences, the world is a place where, sometimes differences dramatically outway similarities. When I turn on the television, look online, or open a newspaper, violence litters nearly every news headline. I saw for the first time, the effect that all this violence has on the world as a whole, during my second stay at camp in 2016, and the coup d’état attempt in Turkey occurred. Usually, when I hear this kind of news, it feels distant and unrelatable. And, a mentality of well it’s someone else’s problems can easily be conceived. But, when I heard the news at camp, a look of worry and anguish fell upon the face of the girl from Turkey. I saw what it really means when I hear this type horrible news. It means that someone does not know whether or not their family is okay. It means that someone does not know if they have a home to go back to. It means that the acts of violence in this world don’t just affect some of us, but rather all of us. Luckily, this global unrest does not always define the way we act as individuals. When I saw a girl from Israel and a girl from Palestine getting along and even hugging and crying together at the end of the program, I realized that who we are as humans sometimes outways who were as nations. Two girls, from two nations who can’t seem to get along, were able to love one another because, they were able to look beyond where each other comes from and see each other as people rather than countries. I believe we must change as a human race, to make this world a better place. We must love one another like family, rather than see each other as the adversary. Because, every culture provides a critical contribution to this world. And, by being able to appreciate, rather than criticize the values and beliefs of others, I have become more accepting of myself. Question your assumptions. This is a phrase that a counselor told me at the beginning of my first summer at Camp Rising Sun that became a major driving message not only for my entire summer, but also for my life. After my second summer at camp I wanted to combine my curiosity and desire to question assumptions with my love for biomedicine by becoming involved in scientific research. I was accepted as a high school research intern at the U.S. Food and Drug Administration where I looked at sugars surrounding bacteria in order to find ways to improve the vaccine for meningitidis B. Meningitidis B is a bacterial disease that causes severe infection of the thin lining surrounding the brain. At the moment, the region of the world that is most affected by this disease is sub-Saharan Africa. This past summer I was accepted to participate in National Science Foundation’s Research Experience for Undergraduates Program at San José State University. I worked with a gene editing tool called CRISPR/Cas9 to find a lifelong cure for hemophilia A. Hemophilia A is a genetic disorder that causes increased bleeding mostly in males. As a second year university student at the University of Toronto – St. George studying cell and molecular biology, I am currently doing research at St. Michael’s Hospital on cellular interactions and signaling. This work is being done in order to find potential treatments for conditions such as atherosclerosis, obesity, cancer and neurodegenerative diseases. Another key message that camp taught me was the need for service and the fostering of greater diversity. Science, Technology, Engineering and Math (STEM) is a field that lacks diversity. According to the U.S. Department of Commerce, in 2017, despite the fact that as many women as men hold undergraduate degrees, women made up only 30% of all STEM degree holders. Also, women made up only 25% of college-educated STEM workers. According to the National Science Foundation, in 2015, women of color made up less than 10% of all working scientist and engineers in the United States. In order to help bring greater diversity to STEM I have become involved with an organization called Visions of Science that gives me the opportunity to educate children that live in underprivileged areas of Toronto about STEM. Through my experiences in scientific research, I have not only realized the global reach that research has but have also seen the effect that the lessons that I learned at camp have had on me. I believe that biomedical research can be a driving force for promoting greater acceptance of one another. Each person’s body is deeply unique but also contains many core commonalities. Scientific research allows us to not only understand the human body but more importantly learn how to fix it. This need to comprehend the intricacies of something that is at the same time so familiar but elusive can help us have greater relationships. I hope to one day be able to not only help heal the human condition but also the human bond through science.